The weather for a few days before the Run and BBQ had not been promising but we awoke to sunshine on the Sunday morning and it stayed that way for the rest of the day, we all breathed a sigh of relief! Dave and Kate organized the 51 mile route starting from the Marage, Thirsk car park .The first car leaving at 1.15pm with 5 minutes allowed between the 12 cars, so no cheating could take place. The cars headed in a south westerly direction, the navigators clutching the route and a list of 20 treasure hunt questions, not only did the navigators have to cope with relating the questions to the driver but the route had some of the sign post names written in not necessarily the right order e.g. NTOALD=DALTON or KWADLAR=ALDWARK. A happy crowd of people arrived for the BBQ, at Tony and Sheila's house from 15.45 to 16.15 ready to tuck into the food and drink, there were 27 people in total. 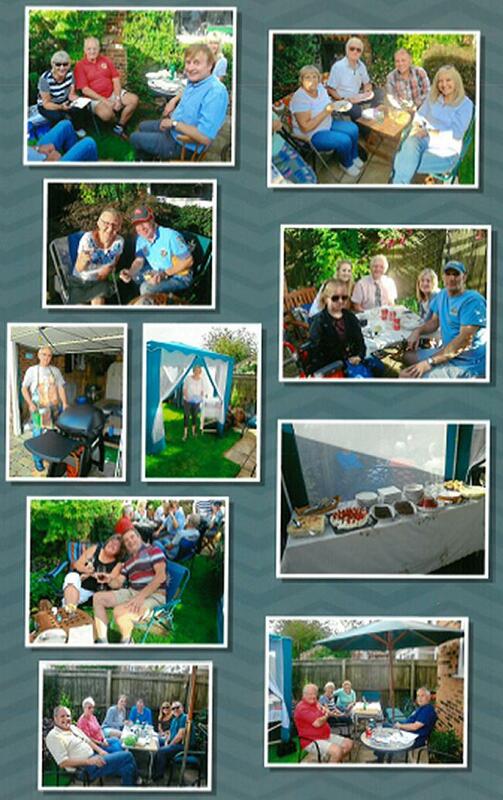 Tony manned the BBQ with great skill and everyone appeared to enjoy the food. Once the main course was finished, Dave announced the winner of The Treasure Hunt; a loud applause rang out for Ian and Julie. Dave did give the results in reverse order but we will not announce who came last in the newsletter! Once the laughter had ceased we then commenced with the Desserts, thank you to Bill, Kate, Jean and Sue for providing some extra Desserts, the serving table looked magnificent. Thank you to Sue for continuing to knit and sell the Hedgehogs, a few more were sold on Sunday also thanks to Richard and Jean for bringing their home grown plums to sell for our charity. It was great to see some new members at the event and they all seemed to enjoy the experience. We already have volunteers for next year’s Treasure Hunt and BBQ, Richard and Jean are organizing the run and Martin and Sue are hosting the BBQ. It’s great to know at least one part of next year’s calendar is already sorted. Finally Dave, Kate, Tony and I would like to thank everyone for coming and enjoying themselves.